The Mercedes drivers start their flying laps, so let's see how they compare. Rosberg pipped Hamilton in FP1, remember. No sign of the medium tyre yet, either. That should come out for some quick quali laps later on. Hamilton goes purple in all three sectors, enough to put him P1 with a 1:35.432. Rosberg has a lock up coming through the final chicane and ends up six tenths off his team-mate. The sector times suggest Rosberg would not have beaten Hamilton even without that moment. And we have ANOTHER car in the wall. It's Gutierrez this time - someone who had just entered the track on the medium tyre. Are they going full throttle through 130R ? @MichaelBialocur: There was an on-board of Kimi this morning lifting during the middle of the corner. 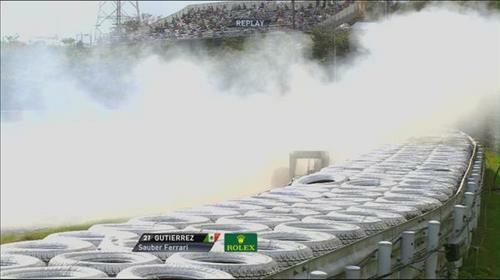 Gutierrez sheepishly walks away from his wrecked Sauber. The off is at Spoon, and it looks like he just got too wide coming in, ran wide and lost the car. In the midst of that, Raikkonen split the Mercedes with a 1:36.529. 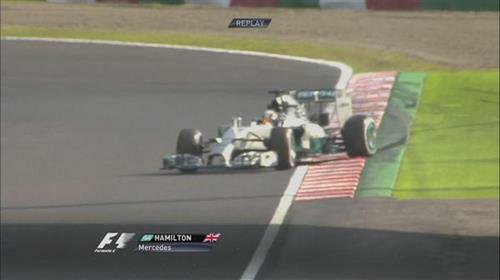 That is misleading, however, given that Rosberg would be much closer to Hamilton were it not for that chicane lock-up. Gutierrez sporting some glasses under his helmet - much like Sebastian Bourdais did and continues to do. Seeing a replay of Grosjean running along the tarmac'd run off on the outside of Turn 1 after missing his braking point by a mile. That sanitised run-off area saving the Frenchman from a really big shunt there. The list of casualties in this session: Kobayashi, Vergne, Ricciardo, Gutierrez. Kvyat runs wide across the kerbs at Turn 1. Still no lap time for Perez, who doesn't even have his helmet on in his cockpit. Button appears to have a small lift coming through 130R as he jumps into P2, albeit on the medium tyre compared to everyone else's hard tyres. Big moment through Degner for Hamilton, who slips and slides but just manages to save his car. That could have been a disastrous moment for the championship leader. @RCC: Thought he may have tentatively lifted. Either way, the drivers aren't holding much back through there. Hamilton has bolted on some medium tyres too, by the way, which probably explains why he was pushing like that. Bottas has jumped into P2 on the medium tyres, while Vettel goes fourth. Hamilton shaves three tenths off his hard compound time on the option tyre, lowering that benchmark to 1:35.078. Rosberg also out on track, with a set of white-striped medium tyres. Rosberg begins a medium compound lap of his own. What is the problem with SFI, they have done least laps in FP1 and now they seem too bad..
@RawPace: The team has not said what the issues are yet, but there's still a bit of work going on his car. Rosberg goes through 130R flat-out, clearly, but a ragged lap can only put him P2, two tenths down on Hamilton. Rosberg had a few lock-ups and ran a little wide on a few corners on that run. They are indeed, ominously gathering near the final corner. Shouldn't affect this session but it's a reminder of the rain we should expect later this weekend. Hulkenberg is out on track, while Perez appears ready to head out himself. One notable result is Raikkonen being a tenth up on Alonso - not a sight we've seen much of this year. @RohanMehta: The race did not reach the required 75% distance. Hulkenberg goes tenth with his latest run. Yep. The McLaren raking up a large chunk of astroturf after running a bit wide on his latest run. 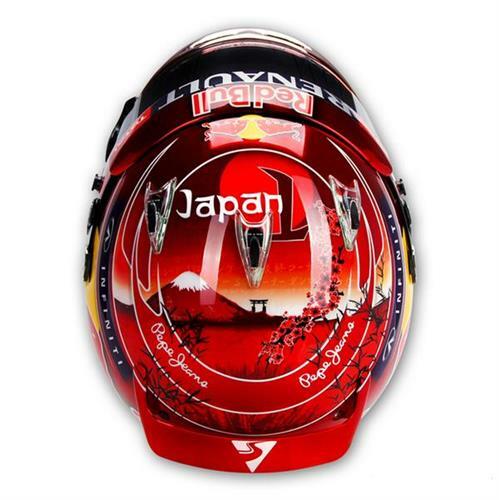 That isn't the lid Vettel was wearing this morning but is his list for FP2.